Always a hit when tucked inside boxes of Christmas sweets, these are a rich, sweet, chewy cookie that is almost a candy. The bittersweet chocolate balances the sweetness of the coconut and the flavors work very well together. 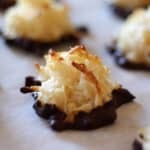 I’ve made these macaroons at Christmastime for the past 3 years. 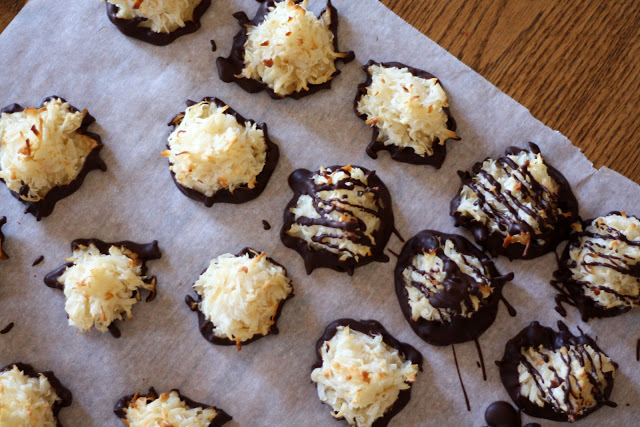 If you love coconut anywhere near as much as we do, you will absolutely fall in love with these cookies. * These cookies freeze perfectly. I tuck them into freezer-safe ziplocs and remove as much air as possible. I’ve frozen them for up to two months at a time and they taste the same as fresh each time. Simply thaw at room temperature for about an hour before serving. Preheat the oven to 325 degrees. Line two baking sheets with parchment paper or silpat mats. In a large mixing bowl, combine the milk, egg white, vanilla and salt. Stir to combine well. Add the coconut and stir again. With a medium size scoop or a couple of spoons, scoop 1 1/2 - 2 tablespoon size mounds of the coconut mixture onto the baking sheets. Once the cookies have all been scooped onto the sheets, use your hands to press them firmly into mounds that have a peak at the top. 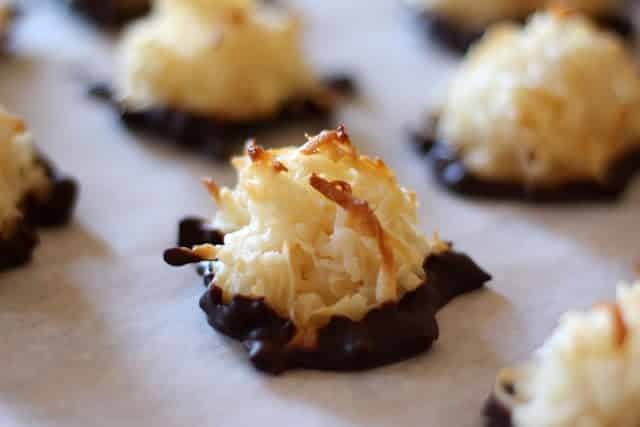 Bake for 15 - 20 minutes, until the coconut looks toasted on top of the cookies and they are lightly browned. 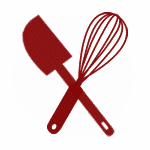 If you are baking both sheets at the same time, rotate the trays half way through the baking time. Remove from the oven and cool for at least 5 minutes on the baking sheets. The cookies should be firm and set. Remove to a wire rack to finish cooling. Once the cookies are completely cool, melt the chocolate in a small glass bowl. Microwave the chocolate at 50% power, stirring every 30 seconds. Once it is smooth and completely melted, lay out a fresh sheet of parchment or wax paper on a baking sheet. Dip the bottom of each cookie in the chocolate and then place the dipped cookies on the paper to dry. Place the finished cookies in the refrigerator to harden or allow them to harden at room temperature. You can drizzle the cookies with extra chocolate if desired. Store the macaroons in an airtight container in the refrigerator. Enjoy! Omg this is my favorite recipe! Made them for Christmas, made them 4 times after that and gave the recipe to those who asked for it!!!! Had a huge craving for these, Google brought me here. I am so glad!! These are AMAZING.